The USA General Meeting is at 7:00 PM on Wednesday November 2, 2011 at the NDC, 1401 Hollins St.
Everyone is welcome and invited to attend. We need you to volunteer, participate, promote, distribute fliers, and sponsor our events. We need you all. Bring your friends, bring your ideas, bring your energy, bring your enthusiasm. Come to the meeting and get more information on how you can help. 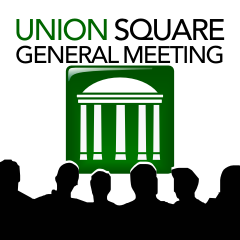 If you have never attended a meeting, see what you've been missing - find out what's going on, meet your neighbors, get involved and discover more about what makes the Union Square neighborhood so special!